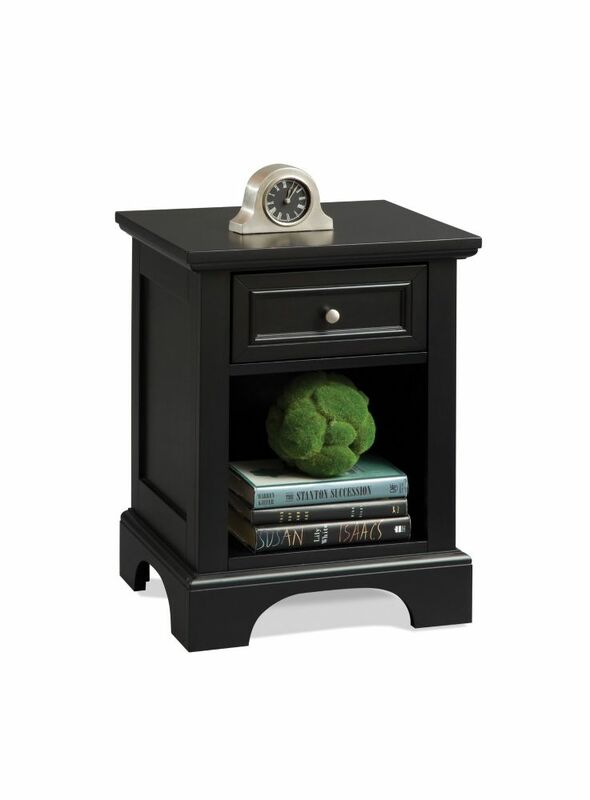 Designed for top-notch style and durability, this Home Styles nightstand makes a beautiful addition to any bedroom. With a beautiful traditional look, this piece is sure to make your home even more stylish. This handy nightstand is the perfect addition to any bedroom with its ability store books, hold a lamp, or even place your alarm clock on it. The perfect blend of style, functionality, and quality craftsmanship, the Liberty Mid-Century Modern Nightstand 1.0 is as practical as it is a statement piece. A cool metal handle attachment, the bottom drawer is perfect for stashing away books, magazines, or electronics, while the open top shelf is prime for keeping items on display. Top it off with favorite photographs or artful confections to create a bold accent, beautiful in any space or decor. The Liberty Mid-Century Modern Nightstand 2.0 is where modern functionality meets quality craftsmanship and smart design. Cool metal handles protect a pair of drawers durable enough to carry 22 lbs. and a base top perfect for showcasing books, magazines, or candles. As an end table or as a nightstand, the piece serves dual purposes and blends well in any space. Nexera Opaci-T 1-drawer night stand is offered in a trendy black and ebony finish with a scratch resistant melamine top panel. Its convenient drawer is mounted on solid metal slides and provides handy storage when you're in bed. Bedford 18-inch x 24-inch x 16-inch 1-Drawer Nightstand in Black Designed for top-notch style and durability, this Home Styles nightstand makes a beautiful addition to any bedroom. With a beautiful traditional look, this piece is sure to make your home even more stylish. This handy nightstand is the perfect addition to any bedroom with its ability store books, hold a lamp, or even place your alarm clock on it. Bedford 18-inch x 24-inch x 16-inch 1-Drawer Nightstand in Black is rated 4.0 out of 5 by 1. Rated 4 out of 5 by RocketBoy from Needed a printer stand to match other office furniture..........worked out great! Nice quality. ... Needed a printer stand to match other office furniture..........worked out great! Nice quality. Actually using a couple bedroom pieces to work in the office!